Airsoft Question about Airsoft tools and equipment to maintain my guns? How often? "What are the typical type of tools/equipment/oils that I need to maintain my Airsoft guns (like keep them clean and ready to use)? How often should I clean and maintain my Airsoft guns? If I use them everyday, should I clean them everyday? Or what if I only use mine once every two weeks? Hope this makes sense! THANK YOU in advance"
Hi Martin! There are a couple of highly useful tools you’ll need to work on airsoft guns. A Phillips screwdriver is a must – preferably a magnetic one! 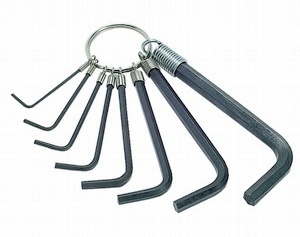 A set of allen keys is also essential. A pin punch is useful for removing sticky body pins, but an allen key will also do for this in a pinch! Between them, you'll be able to strip down just about any gun out there. Get a set of jewelers screwdrivers as things like hop units often have some very small screws and you'll need a torx screwdriver for opening up some gearboxes as TM and some other brands use torx screws. You'll want a soft cloth (preferably lint free) which you an cut into strips for barrel cleaning, and some silicone oil for cleaning the barrel and lubing some parts. It's best to clean a gun after each day's gaming – that way you can always be sure of using it in top condition.